The Renault Eolab concept has a range of 60km under electric power only. RENNES, France -- French automakers are putting a big emphasis on fuel efficiency at the Paris auto show this year. Already considered among Europe’s best at making frugal, low-emission powertrains, PSA/Peugeot-Citroen and Renault aim to maintain their standing – and they are using money from the French government to do so. Sister companies Peugeot and Citroen both will unveil concepts that use lightweight materials and a compressed-air hybrid drivetrain to deliver consumption figures as low as of 2 liters of gasoline per 100km (U.K. 141 mpg; U.S. 117 mpg). Renault, meanwhile, will show a lightweight new plug-in hybrid concept that offers consumption as low as 1 liter per 100km (U.K. 282 mpg; U.S. 235 mpg). “PSA and Renault do well on the fuel-efficiency front in Europe,” IHS Automotive analyst Ian Fletcher told Automotive News Europe. “They both have vehicle ranges that are pretty heavily focused on the smaller vehicle categories, they have strong backgrounds in diesel technology and both have also embraced engine downsizing." An undisclosed portion of the money used to create the show cars came from the French government, which in 2009 agreed to provide the automakers 3 billion euros each in emergency financing in the form of low-interest loans. At the time of the loan, PSA said it would use most of the money to develop fuel-efficient, low-emission vehicles. Renault also said it would use the funds to develop vehicles with zero or very low CO2 emissions. Government support has also extended to French suppliers such as Faurecia, Michelin, Plastic Omnium and Valeo, all of which have played important roles in the development of aerodynamics, lightweight materials and powertrains for PSA’s and Renault’s new concepts. Significantly, the key challenge for the suppliers has been to demonstrate that the components they developed were sufficiently cost-effective as well as reliable for use in production models, a spokesman for Faurecia told Automotive News Europe. “The role of the suppliers in the project was to transform an idea into viable parts for street legal prototypes that will eventually see full-volume production,” the Faurecia spokesman said. The concept vehicles being unveiled at the Paris show include Citroen's C4 Cactus Airflow 2L, Peugeot's 208 HYbrid Air 2L Demonstrator and Renault's Eolab. Both the Cactus and 208 concepts are 100kg lighter than existing production counterparts due to the use of lightweight materials such as carbon fiber, aluminum, high-yield steels and composite materials. They are also more aerodynamic. The PSA's hybrid air system has been developed with supplier Robert Bosch to be lighter than a hybrid running on gasoline and battery power and to reduce the cost of cutting emissions compared with existing hybrids. The technology uses the vehicle's engine and brakes to compress air, which is stored in pressure accumulators. The system allows the vehicle to be driven conventionally, hydraulically or by a combination of the two. According to IHS, the next-generation Citroen C3 will likely share some of the C4 Cactus concept's lightweight materials, aerodynamics and powertrain when it launches in 2016, followed by a similarly fuel efficient Peugeot 208 in 2019. Renault says its Eolab concept previews fuel-saving technologies that will appear gradually on its production cars before 2020. 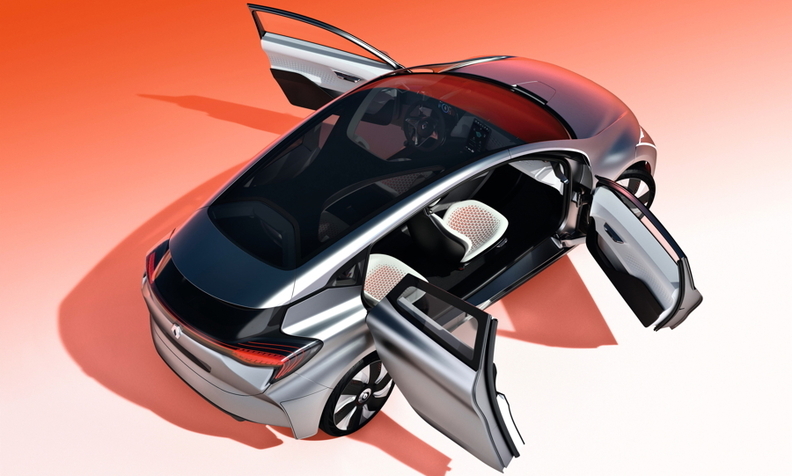 The Eolab has a 75hp 1.0-liter three-cylinder gasoline engine, a 6.7 kWh battery and a clutchless three-speed transmission with an integrated electric motor. The powertrain has a range of 60km under electric power only. PSA and Renault’s German rival Volkswagen introduced its version of an ultra fuel-efficient car last year. VW claimed its two-seat XL1 plug-in hybrid was the most fuel-efficient production car in the world, consuming 0.9 liter of diesel per 100km (U.K. 313mpg; U.S. 270 mpg).